Today was back to school orientation for my son who is going into the 1st grade. To get a head start on the day I had two shots of espresso at 7:00 this morning. Before we left the house, I had one more cup of regular coffee. 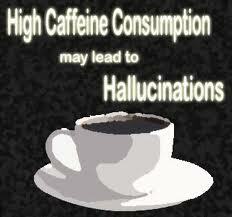 Here’s the thing…there is such a thing as a caffeine high. It’s weird because my limits are different. Today I think my doses were too close together. My caffeine high makes my eyes wider though I can’t see any better. I feel like I am squinting with stretched eyes. My feet are on fast forward, my brain is bright, senses are heightened and my pulse is a little on the rapid side. I had a reaction to Percocet once; a little green man with a big head who I’ll never forget. Other than that, I have no idea what street drugs feel like; but a caffeine high for me is also weird and I don’t like it. She just gave my caffeine high another boost. We get in the store; I hate frenzy. I refer to my list getting the things I went in for, adding a bag of chips, more lunch meat and cheese that we can eat before it goes bad, extra bread, two bottles of wine and another 3-gallon bottle of water to add to the two that I already have. Someone’s service dog seems nervous and that makes me nervous. I’m wondering if his calm owner is about to have a seizure or something. I relax my frantic thinking, justifying that the dog must be new on the job or maybe this is his first time in Walmart when people are shopping for a storm. Both my son and I are hungry. My hands are a little shaky; it could be the caffeine or it could be the hunger. Next stop Subway for a foot-long; I nervously eat my half in the car. When we get home, I bring in the groceries and put them away. A Netflix movie has come in the mail so my son is busy watching it and eating his half of the sandwich. I finally sit down to the computer; simultaneously facebooking and returning text messages on caffeine speed. While I’m sitting at the computer leaning on the desk I say to myself, my heart sure is beating hard. It’s making the desk move. I push off the desk with a frown on my face. Am I seeing things? The desk is still moving. In a leap I am where my son is. I say, “Turn off the TV, come here!” We are both barefoot standing in the kitchen, I see the kitchen table wobbling and the entertainment center is rattling our souvenirs. We aren’t far from the base but this is not the firing range, or a helicopter flying low. It’s only a matter of seconds this is happening that I think, I know what to do when there’s a tornado, I know how to prepare for a hurricane but this is the east coast, are we having an earthquake!? We are standing in the kitchen and my son is holding me around the waist as he asks, “Mom what is on top of our house?” There’s nothing like a naïve question from your child to come up with a rational answer to calm everyone down. Mine was, “I don’t know”! I’ll have to explain tremor, after-shock and earthquake so that was the best answer I could come up with.